Heidi's Diary: Happy Birthday Deanna! As a result of blogging I have met many new and wonderful friends. Today is my friend Deanna's Birthday. She is having a Baby, Blogging, Birthday Bash. At her request I post these shots of me as a tot....( in my party best of course) This picture was taken at a birthday party on the Ms. Berlin, the ship we went to Europe on, in 1964. This was my party dress, a light blue and tiny white polka dot dress my Mom made, my sister and I had matching ones. 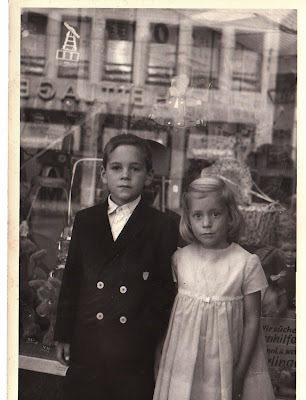 Me and my big brother in front of a toy store in Germany the same year. I'm sure if I had known Deanna then we would have gotten her something wonderful! Many Happy Returns of the Day Deanna! I LOVE IT!!! I knew that you were born with a Tiara and a Party Hat!! You got it goin' on girlfriend!! How wonderful to have traveled to Europe at such a young age. You must post more pictures of that trip! You are a mighty lovely little girl Heidi. Thank you so much for helping me to celebrate this special day with me! I am so glad that we have become good Bloggy friends. I always look forward to seeing your comments on my blog. You are a sweet and loving lady and I hope someday to meet you. What precious photos! Love the tiara! Stopping by from Deanna's place! What adorable baby pics! Have a beautiful day! How wonderful that you were able to travel when you were young. It looks like you had lots of pretty dresses to wear too! I always loved wearing dresses when I was little and my Mom would occasionally sew up something for us to wear. I can't wait to see you tomorrow for the continuation of this fun Birthday Bash! Isn't this a fun party?? 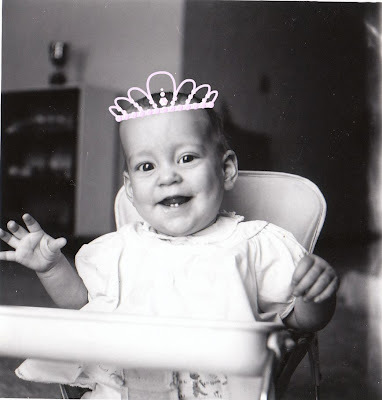 Darn it.....I so wish I had remembered that little crown...My daughter actually did that to my baby picture a while back...You were SOOO darn cute! And, what a smiley little baby you were. I can't wait to see all the other little cuties..
What cute pictures : ) I love the tiara. What adorable childhood & baby photos!! Every girl needs a tiara on her bday!! You & your brother look precious!! What beautiful photos! I love the tiara too. Oh what a cutie!! Isn't this a fun idea our sweet Deanna had!! It is nice to meet you! Girl, you got it goin' on with the tiara. What a pretty pretty smile on such a lovely baby! We didn't get to post our baby pictures as Byisteal and I are out in Florida right now with our hubby's and kids on a family reunion. This is the first chance we had to comment on all the party goers!